It comes out this fall. But we got a first look at a piece of luggage that might just change the way adventure travelers tote their goods. Roller bags rarely make our news feed, but once in a while a brand does something notably different, and that’s surely the case with the Ascender 22 from Kelty. In short, the modular system can be used as a carry-on, a 70-liter checked bag, or a backpack when wheels won’t do. This chameleon design is accomplished by an external chassis that expands and shrinks as well as a bag that has hidden straps and expandable pockets. We didn’t fly across the world, but we did a quick test for functionality this week in Boulder and came to see real promise in the product. It could be a one-bag solution for frequent travelers or a perfect suitcase for the occasional visitor to exotic places. With a quick adjustment, air travelers can expand the bag by 75 percent. It converts from a carry-on size to checked luggage. This lets you fly to your destination without checking a bag, but after a shopping spree in the markets of Mumbai you can pack your loot in a newly-expanded bag and check it on the flight home. 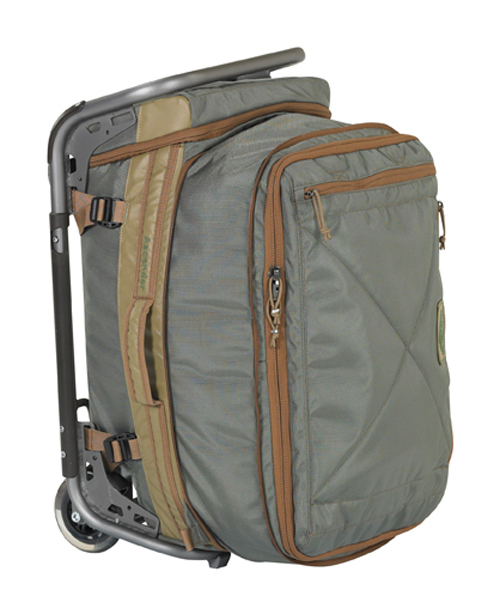 The expandable roller chassis works in both configurations for easy dragging through customs. Kelty will also sell a waterproof duffel and an 80-liter, hard-side trunk that can be mounted on the Ascender 22’s frame. Cool, no doubt. But you will pay a premium price of $349. I had the chance to examine the Ascender 22 and found it well designed, durable and functional. Loaded with about 25 pounds of clothing and gear it rolled and carried smooth. The heart of the system is an aluminum tube chassis that attaches to the outside of the bag with loops of fabric and elongates through sliding joints to accommodate the enlarged, 70-liter Ascender 22. The chassis also detaches completely to create a light backpack for day use. 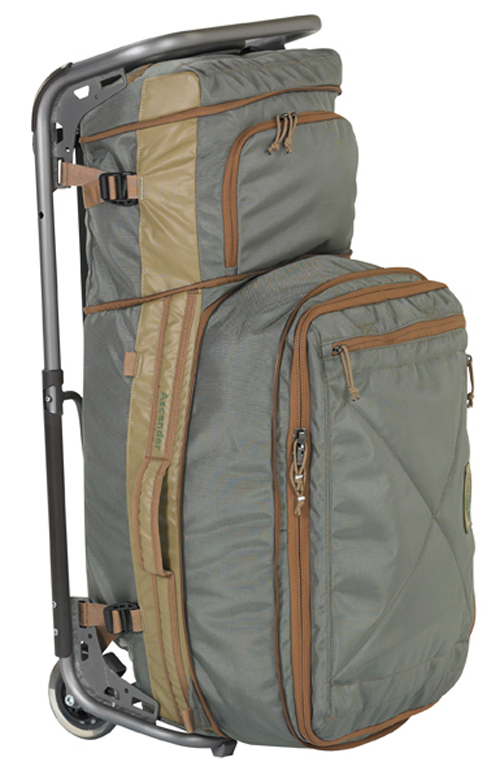 The bag can carry 40, 55 or 70 liters of gear depending on configuration. The aluminum frame is light yet durable feeling. To expand the chassis one must press two buttons and extend the tubular frame. It then locks into position with a firm snap. It takes a solid tug to pull the handle of the roller up, a nod toward the robust construction that I expect would make for a long lasting piece. 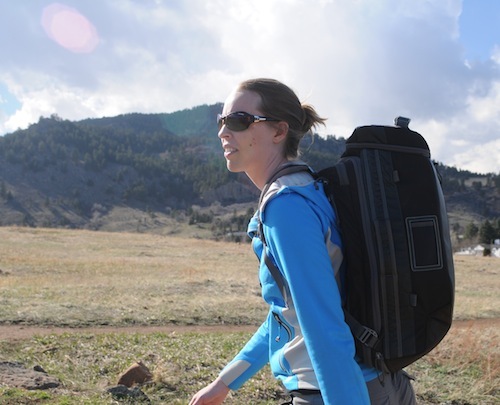 I pulled the pack off the frame for a little backpack testing and went for a hike near Boulder. With 25 pounds on board, the luggage bag carried OK, much like an oversized book bag. While it is clearly not designed as a hiking backpack, the shoulder straps create a very useable day pack that could easily carry items for a couple miles through terrain too rugged for a rolling bag. The shoulder straps are soft and while there is no hip belt the pack fell right in the middle of my back. The adjustable straps appeared to be sized to fit the vast majority of adults. 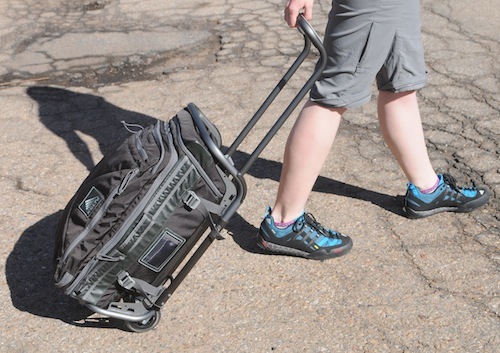 Overall, the Ascender 22 would be a great piece in anyone’s adventure travel arsenal. While it’s far from inexpensive, the versatility of the “three bags in one” configuration adds enough value that the cost could be worth it for anyone in search of a modular system made for traveling the world.